Bei der Ideenfindung zu diesem Bodypaint von Christine Dumbsky war die Überlegung des Auftraggebers etwas passendes zum Firmenkonzept und Jubiläum zu konzipieren, somit gab dieser den letzten Impuls zur Umsetzung, indem er die Künstlerin auswählte um für seine Abendgala ein "Weltthema – DAY and NIGHT" zu inszenieren - umgesetzt mit Bodypainting. Sometimes the artist uses a song, it’s mood, it’s lyrics or poems to process them in a picture. An almost inevitable development. As also her development of painting in conjunction with bodyart, photography to moving pictures accompanied with music, specially written for this purpose. To this concept her instrumental musical work, should be used later as background music as its acoustic creates a certain mood and captures the complexity of the painting on canvas, on skin, the live and photo sequences to make it tangible. The intention was also that all components of the whole unit of this moving picture creations should be created all in all by the artist to ensure that the complete work will remain one unit . 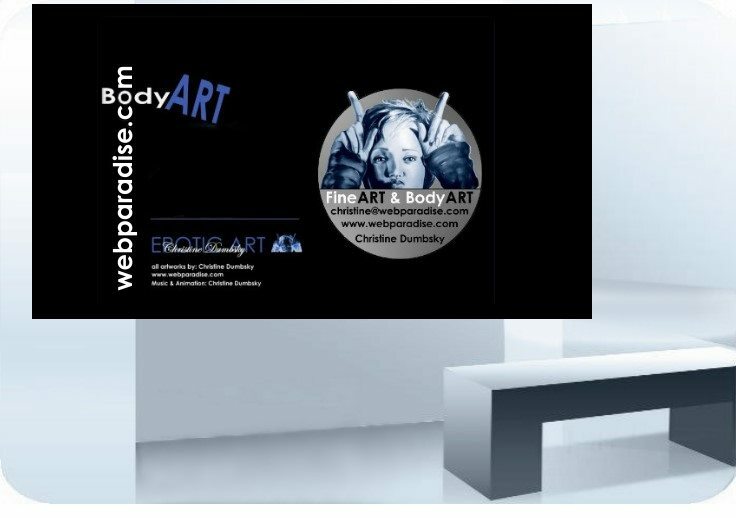 The the final impulse to the implementation gave the client and it’s company philosophy who selected and engaged the artist for doing a theme kind of “we supply the world – day and night” for his evening event – implemented with bodypainting. The idea to create a live picture - at the same time glamorous, graceful, - classic and in a certain way ambivalent - especially where the models would have a dress only made of color.